You want to watch the video below. UNTIL YOU HAVE TAKEN THIS PRODUCT. 29 STRAINS of friendly bacteria, one of the most potent brand of Pro-biotics on the market. Once you have taken this brand of Pro-biotics, you will no longer be satisfied with the others. Try it for yourself and feel the difference. No other brand on the market come close to its potency and the variety of species of bacteria. Benefits of Prescript-AssistUnlike other probiotic supplements, Prescript-Assist™ is a synergistic blend of not one or two, but a full 29 probiotic strains, specifically chosen to mimic the natural flora found in traditional and paleolithic diets.10, 11 But Prescript-Assist goes further. Is it Time to Stop Worrying About Your Probiotic? Prescript-Assist™ is a next generation professional probiotic supplement designed to take the worry out of your probiotic routine. Why is Prescript-Assist a better choice? 29 Symbiotic Strains: A balanced formulation specially selected to mimic the natural flora found in traditional and Paleolithic diets. As a dietary supplement for adults, take 1-2 capsules per day, or as directed by your healthcare professional. May be taken with or without food. Routine viability testing confirms >95% viability two years after date of manufacture — without refrigeration. See individual package for expiry. Why worry whether your probiotic contains adequate, living flora sufficient to improve your health?Unlike fragile probiotics that require refrigeration and novel, untested manufacturing techniques to be effective, Prescript-Assist™ is a proprietary formulation of 29 naturally resilient strains that support your body's natural intestinal balance. It's time to move past the stranglehold of lactic-acid based bacteria to a next generation of stronger, inherently viable strains.3 The Prescript-Assist solution is convenient, traditionally-derived, and clinically proven to enhance GI health and promote a healthy balance of good bacteria in the gut. Prescript-Assist® (P-A) is a 3rd-generation combination of >29 pro-biotic microflora “Soil-Based-Organisms (SBOs)” uniquely combined with a humic/fulvic acid pre-biotic that enhances SBO proliferation. Prescript-Assist’s® microflora are Class-1 micro ecological units that are typical of those progressively found resident along the healthy human GI Tract. And, with more than 5 years in clinical development and testing*, Prescript-Assist remains one of the most effective pro-biotic supplements for restoring levels of gastrointestinal micro-flora compromised from antibiotics, medication, poor diet, stress, and digestive abnormalities. 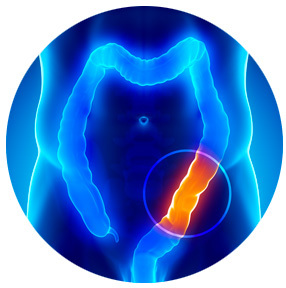 A primary objective of pro-biotic therapy is to provide therapeutic resistance against pathogen colonization in the GI tract. Prescript-Assist® is unique in this regard as its constituent microflora are representative of those found resident along the healthy human GI tract (vs. most common pro-biotic products). Its beneficial/healthy microflora, coupled with a proprietary pre-biotic, provide for robust maintenance/enhancement of gut microflora and resistance to pathogenesis. Prescript-Assist’s® microflora arguably contribute to better health in their in-vitro and in-vivo demonstrated abilities to produce vital nutritional components (antioxidants, enzymes, etc). Quite unlike most pro-biotics that incorporate easily degradable lactic acid based microorganisms, the utilization of Soil Based Organisms in Prescript-Assist® provides for a pH resistant (able to survive trip through the stomach) and shelf stable (does not need refrigeration) product. Take 2 per capsules of Prescript-Assist® per day for the first 30 days, followed by 1 to 2 capsules per week thereafter. A full 30 day cycle of 2 caps per day should be used to reconstitute beneficial gut flora following any antibiotic regimen. ​those who are on long term medication may need to take these on a daily basis. You don't fine this anywhere else! It's time to move past the stranglehold of lactic-acid based bacteria to a next generation of stronger, inherently viable strains. The Prescript-Assist solution is convenient, traditionally-derived, and clinically proven to enhance GI health and promote a healthy balance of good bacteria in the gut. GI distress can be the result of an imbalance in the makeup of healthy bacteria found in your intestines. And ongoing medical studies continue to reveal the importance of gut-friendly bacteria for daily health. From immune stimulation to vitamin production to anti-microbial agents and even emotional health, the good bacteria in our digestive system play an important part in how our body stays healthy and performs. ​What's wrong with other probiotic supplements? Most probiotic supplements on the market today rely on 1 or 2 strains of fragile, lactic-acid based bacteria. Prescript-Assist is different. 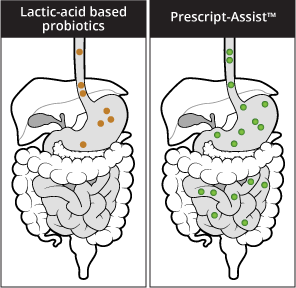 Unlike other probiotics, Prescript-Assist has inherent viability. That means the species selected for inclusion are naturally adapted for survival in the human GI tract. Among the 29 beneficial organisms found in Prescript-Assist are a class of bacteria commonly referred to as "spore-formers". "Spore form probiotics are the Chuck Norris of probiotics: total tough guys." While other manufacturers struggle to invent novel manufacturing techniques such as patented nano-encapsulation and hard-shelled enteric-coated capsules in an attempt to essentially "force feed" lactic-acid based organisms into survival, the environmentally based (SBO) species included in Prescript-Assist are selected from the terrestrial microbiome where they have prospered and adapted for millenia to beneficially co-exist with humans.